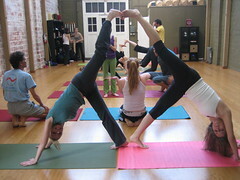 Most health clubs offer yoga classes at no additional charge. You can find a wider variety of styles and techniques at yoga-only studios, which charge $8 to $25 per class. You’ll likely also find classes aimed at different experience levels. If you’re a yoga novice, make sure that you take a beginning class, and don’t try to keep up with anyone else. Yoga can be extremely demanding, both in terms of flexibility and strength. Even if you can bench-press a heavy load in the gym, you may find yourself lacking the strength to hold a yoga pose for a minute. Yoga requires a different type of strength than weight lifting does. For instance, many yoga poses require you to call upon the strength of your abdominals, lower back, and dozens of small spinal muscles that don’t get much action in a weight-machine workout. There’s no national yoga certification, so we can’t list certain credentials to look for in a teacher. In the yoga world, it usually means a lot if you’ve studied with a certain yogi master, but most people have trouble evaluating this type of credential. Rely on your own judgment and word-of-mouth recommendations. A good yoga instructor wanders around the room correcting class members’ techniques and offering variations that allow less-flexible people to accomplish all the poses.